When the world’s largest democracy goes to the polling booth it is history in itself. With election flaring up around the corner, the time is just right for some light and interesting insights on the history of election in India. 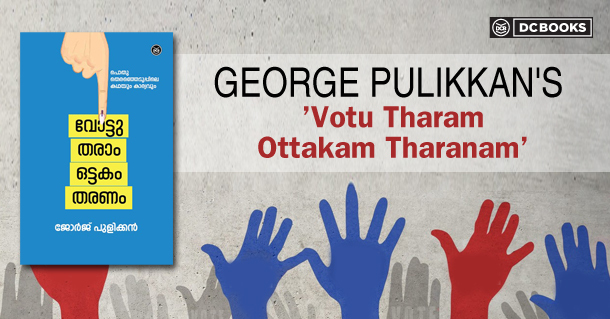 A veteran journalist and the host of political satire programs, George Pulikkan compiles fun and formal facts on India’s democratic process post-independence in his recently published book, Votu Tharam Ottakam Tharanam. Indian democracy took a giant step with its first general election held in 1951-52 over a period of four months. George Pulikkan begins his collection of election trivia with the story of Shyam Saran Negi, India’s first voter. Elections then were a matter of amusement, and unawareness governed a small section of the society. The poll symbols were not perceived the way it should be at first. This is equated with a story from Rajasthan where the voters believed that they would get a camel in return if they voted. Camel being one of the poll symbols then. The book shifts its focus from national politics to the election climate in Kerala, the one the author has traversed through in his previous documentation, of the stories behind political slogans in Kerala. Here the stories are about election discourses in Kerala interspersed with humour. The book mirrors the making of modern India through these years, the fun and facts which we are unfamiliar with and of relevance in the current election scenario.